Have you ever felt like walking back to your desk was like running a gauntlet? Walking through rows of cubes where everyone is eyeing you as you walk past? And then when you get to your desk, you’re in a mock prison cell with a couple other people. Inevitably, one of them gets a phone call and starts chatting up the person on the other end. And your stuck listening and not being able to concentrate on your work. If you’re in a situation like this, it turns out that your company may be wasting some good money by sticking you there. The New York Times recently ran a piece called The Rise of the New Groupthink. The article discusses how creative people are often introverts, need to have real private areas where they can work alone, uninterrupted. How often do you have that situation at work? It turns out that when you’re not allowed to work in such an environment, your productivity goes down and your ire for your coworkers goes up. Companies ought to recognize this, but instead they move in the other direction, making workspaces smaller and less private. I’m fortunate that in my current situation, I have a cubicle in an office with only a couple other people. During part of my time as a grad student, however, I had to share an office with two other people. Actually, I probably feel more sorry for my office mates because I was the most chatty of the three of us. Of course, that didn’t help my productivity, either. What is your office like? How does it affect your productivity? 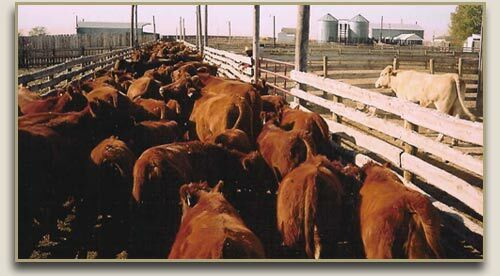 Thanks to Ringstead Ranch for their picture of a normal office environment some cattle. My office fluctuates between a ghost town (when my four officemates work from home) and the social center. I’m much more productive with the former. That’s why I used to work during the evening a lot. I can’t do that as much now if I ever want to see my boyfriend. I was very fortunate. For most of my engineering career, I had my own office that included my desk and my workbench (which at one point included a fairly large homemade light table for pcb layout). We got moved around due to growth. My smallest space was 8×10 and my largest was 12×20. I have an office now for the first time in my career and it has made a HUGE difference for me. I can’t speak to productivity as my job has changed so much over the years, but I’m just so much happier and laid back. So less stressed out an angry. Sometimes someone else’s chewing can really be the thing to set you off at the end of a day. Or a sick coworker who won’t stop coughing. I really wish they could redesign offices to just have a lot of very small offices. Because I don’t think the size is as important as having walls and a door you can close. I have a fairly small office with very little ‘walk by’ traffic–usually, if someone does walk by, they are coming to see me. My office has a desk, work table, bookshelf and a very large monitor obscuring my view from ‘peekers’ out in the hallway…or is it obscuring their view of me! I opted for the smaller office because it was closer to my lab and it didn’t have a window. That’s right, you read correctly, I chose the office WITHOUT the window. Although the window office was larger and, well, had a window, I found myself getting too distracted by the ‘goings-on’ outside. Who just pulled up to the office? Did a dog just run by? Is that so-and-so taking ANOTHER smoke break? On top of all that, I guess the smaller office reminded me of my graduate school days and I’m always up for a little nostalgia.